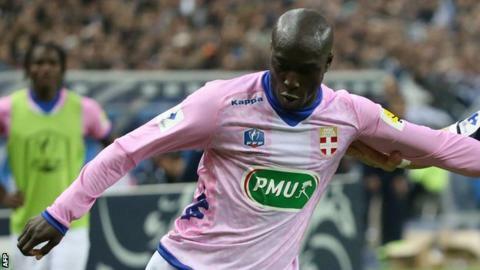 Hull City have confirmed they have signed Ivory Coast striker Yannick Sagbo from French club Evian. The 25-year-old joins the recently promoted Premier League side for an undisclosed fee on a two-year deal. "I am so happy to have signed for Hull City, and I am very grateful for the opportunity," Sagbo told his new club's official website. "I can't wait to get going, and I look forward to meeting my new team-mates this weekend." The Ivorian added: "I want to show the coaches and the fans what I'm all about, but not just with my physical presence. I also hope that my mobility and technical skills can add to what is already a good footballing team." He joins Danny Graham and George Boyd, who has agreed a permanent move after initially joining on loan last season, as Hull's summer attacking recruits. Sagbo, who scored six goals in the French top flight last season, won his only Ivory Coast cap in 2010. Manager Steve Bruce guided Hull to promotion to the Premier League last season when they secured second place in the Championship on a dramatic final day.